28 students from the 8th and 9th grades of the Regnbueskolen high-school in the Aarhus suburb of Hammel visited the London Central Mosque as part of their London trip. "It was a great experience! It was experiencing the religion from within, gave us insight into Islam in a totally different way than we had imagined. We think everybody should try it, especially those who are repulsed by other religions, since it was an experience we'll never forget. 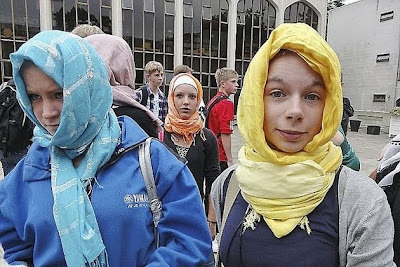 To visit the mosque made us understand that people can easily live side by side while respecting each other, but without the same faith and beliefs," write two of the students, Kristine Frandsen and Alma Fjeldsted. The visit was organized in advance, and an imam awaited at the mosque's entrance when the school arrived. Half the students were girls, and they wore headscarves out of respect for Islam. The students took their shoes off and were then brought into the prayer hall where they were impressed by the serenity. Here the imam, proud, calm, and with a sense of humor, enthusiastically told the students about Islam, and answered questions that poked at the belief, in a positive way. The students then visited the mosque's museum, where they were shown the similarities between Christianity and Islam. In the museum the imam offered the girls and female teachers to visit the ladies balcony. A friendly young Muslim woman then showed up to answer their questions on gender equality, Denmark's headscarf debate, and the conditions, marriage and dress of Muslim women. "Men aren't better off then women, but we all have different roles in society. Women are responsible for teaching their children and making food, while men are responsible for honorably providing for their family. I wear a headscarf of my own free will, not because I'm forced to. I don't have a right to decide who are real Muslims and who aren't, but I think it's disrespectful and see no reason to show off my body in tight pants and low-cut shirts."